In May Jennifer and Abigail moved from the country and into Hutchinson, at Abigail’s request! It was a lot of hard work but very rewarding. We put the farm up for auction and successfully sold it that day. God has blessed our lives in a way only He could. 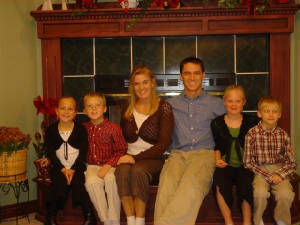 Jennifer married (Jason) in August and gained three lovely children (Addison, Isaac, and Caleb). Abigail still grieves for her daddy(the late Ron Ginest), but brags about her new family! Abigail is 7 and in first grade at Union valley enjoying reading and Math most. She constantly wants to read books and do homework. This summer she enjoyed riding her horse and swimming in our pool. Jason’s three children all currently go to school at South East Saline in Salina. Caleb is 7 and in Second grade enjoying doing crafts in the craft room, roller-blading, and riding his bike. Isaac is 8 and in Third grade enjoying math and computers the most. At home he loves to play his playstation (when we let him) and riding his bike. Addison is 10 and in Fifth grade and enjoys her weekend and no school days. She is playing the trumpet and getting very good at her Christmas songs! Jason is a Business Manager at Long McArthur Ford in Salina in charge of financing. He does put up with commuting for his family. This winter if it’s the typical Kansas winter, he might change his mind. Jason enjoys starting projects and not finishing them, leaving dishes around the house in odd places, and loving his family with all of his heart. Jennifer is still a personal trainer and kick boxing instructor at the YMCA. On November 1st she worked her last day at Subway of 13 years. She loves staying home and being there for Abigail when she gets home from school. She’s been enjoying cooking and crafts. Jason’s waist is plenty of evidence that Jason loves the cooking. Our family pets consist of 6 hermit crabs that can become very boring and not very cuddly. The kids are all hoping for a puppy for Christmas, but it’s not looking very promising. Jason, Jennifer, Addison, Isaac, Caleb, and Abigail.